As an avid reader, you would think that I would be more familiar with classic fairy tales but really, this is my first experience reading Andersen's stories. After reading this collection, I do see, however, how they have helped shape classic movies and stories, as well as more recent retellings. 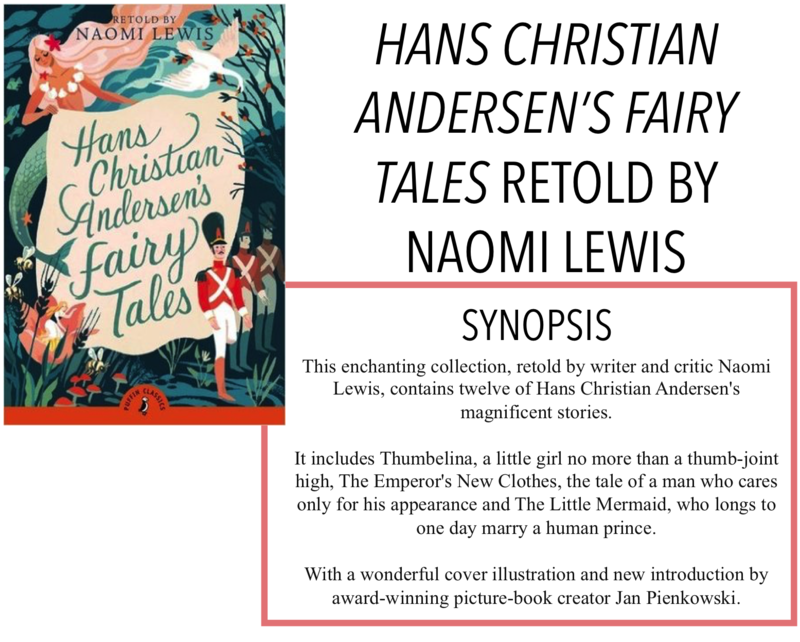 I am back with another review, today it is Hans Christian Andersen's Fairy Tales retold by Naomi Lewis. As with other collections of short stories, I think I will briefly discuss each one individually. Of the stories in this collection, this one was the one I was probably the most familiar with. I think almost everyone knows the story of the Princess and the Pea. I did find it really quick, I think it was only a couple pages, and I would have preferred to see this story fleshed out a bit more instead of some of the other longer ones. 3/5 stars. I wasn't super familiar with this story going in. I know there's a Disney movie based on it, but I don't know if I ever really watched it. It was interesting enough but nothing too spectacular. 3/5 stars. I really enjoyed this story! I thought it was hilarious and says a lot about society and how people want to be perceived. No one wanted to be seen as unfit for their position so they just played along. It took a child to point out that the emperor didn't have any clothes on! On a slightly unrelated note, if anyone wants to write a fairy tale retelling based on this story (or already has), I'd be down to read it! 4/5 stars. Another story I was fairly familiar with, because if nothing else, I've seen the Disney movie. This story, however, was a little bit different and didn't have the happily-ever-after romance with the mermaid and the prince. I was fine with this ending and I found the slight variations really interesting. 3.5/5 stars. I may be way off here but part of me feels like there is a similar story (or at least one with a toy soldier) in Leigh Bardugo's collection of fairy tales. I can't remember the details of that one, but it would be really cool if that story was based on this one. I thought the story was ok, but nothing too special. 3/5 stars. I enjoyed this story as well - I think I might just be a sucker for personifications of Death (and I know that was just a small part of this story). It was one of those "the grass isn't always greener" stories and focused on respecting what you have. 3.5/5 stars. This is another story that many people are likely familiar with. I feel like I read a picture book version of this story when I was a kid but I forgot some of the details. It was a cute story about being different and accepting that difference. 3/5 stars. I recently read a book that was a fairy tale retelling based on this story, but I hadn't heard of it before reading that book. I definitely understand some of the references and things that happened in that book more after reading the story. I think it was a little long, it's the longest in this collection, and there were some parts that seemed a little random, but generally, it was good. 3.5/5 stars. I don't really know if I get this story. To be honest, I don't really remember much about what happened in it, despite the fact that it is one of the later stories in the collection - so I think that speaks volumes for my interest and enjoyment of this story. 2/5 stars. I think this is one of those ones where Andersen used animals instead of humans, but this story could have just as easily been about a human prince finding a wife. 2.5/5 stars. "The Goblin at the Grocer's"
This was another one where I don't think I really 'got' the meaning behind it. I don't know what Andersen was trying to say with this one and it just seemed too short to get much out of it. 2/5 stars. Overall, this was an interesting and informative collection of some of Andersen's more popular, and lesser-known short stories.